The number of children eligible for the free dental service in DHB’s coverage area for 2015, 2016, 2017 and 2018. Please list each year separately including until end October 2018. 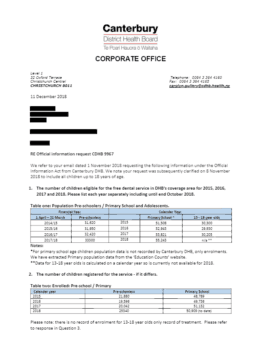 The number of children registered for the service – if it differs. The number of children seen by a dental clinic (including mobile ones) during the above period. The number of reminders sent out to patients/their caregivers each year. Details of why there may have been a difference between the number patients eligible, those sent reminders and those who were seen. Should all patients registered with the service be sent reminders? Have there been any problems which may have led to caregivers not receiving reminders? How often should children have check-ups?